1. Have a great birthday #28! 2. Send at least 10 random gifts this year! 3. Crochet a pretty blankie. 4. Teach Hope how to sew with a machine. 5. Stay true to fitness (no matter the season). 8. Find a place I LOVE. 9. Do another Renegade (or 2)! 13. Get a new computer! 14. Make stop-motion film w/Elsie! 15. Acquire pretty new (old) dollhouse. 16. Do a monthly craft w/Hope. 17. Get a set together w/Johnny. 18. Have a garage sale! 19. Do a "just for fun" shoot w/Erin. 20. Record 1 song where we are entirely happy with the results! 21. See at least 2 great shows. 22. Visit Christin in PA!!! 23. 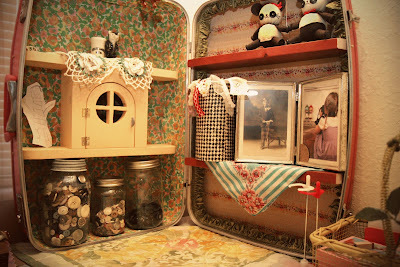 Make a Blythe-size dollhouse. 24. Find those grey LEATHER boots! My suitcase shelves look great no matter what they are housing! Hope and I have been making cute Blythe headbands with her knitting machine. So much fun!!! Those are some great goals! I am working on mine this weekend. What a great list of goals! A skunkboy t-shirt would be cute I am sure! Where did you get that knitting machine, my daughter would love that(I would too)! Good luck and I am sure that you will reach them all! Meg-- it's vintage from a flea market. It works perfectly... I was thrilled! I love writing out New Year's Resolutions/Goals. It's so much fun to see your ideas on paper. You have lots of great ones! hats a great list!!!! i wrote some stuff down but am still thinking over things that really matter to me to accomplish :) oh and um your #6 is very great!! i want a shirt!!!! you look very va va voom in that picture! love the polka dot headband! Aww, I love your Blythes! I just did a major overhaul on my lounging lovely. I have two "blythes in a cup". The Hello Kitty was is amazing! Where did you buy your silver chips at? I am going to try some from This is blythe. I m gonna make a list too! fist thing in the morning, when im done with my vacation! p.s. that knitting machine is crazy insane! Getting new glasses and have a great 28th birthday are definitely goals for me, too! Caitlin: I got all of my eyechips from This is Blythe. I love the grab bag where they send you bunches and then you get to pick and choose! Thanks everyone for supports. I love you!!! Great goals! :) I love it. i love it! i think my main goal at the moment is to write my goals down. traveling over the resolution season put a serious crimp in my list-making. but i like yours! and thanks for the reminder of the wondrous knit-magic machine - i wish i'd kept mine. i loved it. i LOVE your shelves! it's so inspiring! your blog is one of my biggest go-to's for inspiration so if it is alright i posted your button on my blog in order to get more people in love with your cute creativity! p.s. i'll also be posting pictures of my new "snail" mail on my blog soon. your b girls are cuute.